TORONTO--(BUSINESS WIRE)--In celebration of Canada’s 150th year, Explorer150, Canada’s first cross Canada streamed drone journey is underway. This unprecedented journey covers more than 11,000 km of Canada’s diverse terrain. Supported by two of Canada’s most trusted brands, Duracell and Maclean’s, the trip provides Canadians a first class ticket to exploring unsung heroes, undiscovered nooks and hidden gems. From living rooms, mobile phones and computer desktops, Canadians will witness a Canada they have never seen before, as the entire drone journey will be documented and shared through streamed footage. 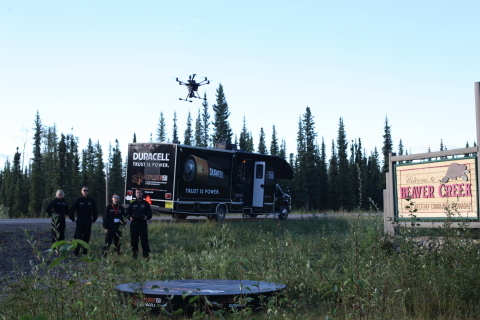 Canadians interested in following the journey can visit duracelldrone.macleans.ca. The website shares the progress of the drone and accompanying RV as well as view a wide array of footage updated daily. Going where no drone has gone before, Explorer150 will be bearing witness to Canada’s diverse landscapes, terrain and people, much of the journey covering lesser travelled areas. The flight starts in the most westerly community of Beavercreek, Yukon and travels across the country with stops in each province and territory, ending in the most eastern tip of Canada in St. John’s, Newfoundland. In addition to the streamed footage, the Explorer150 program also shares stories of everyday heroes who power the country. One feature editorial video was produced in each province and territory and will be featured online as the drone crosses near the hometowns of the feature stories. Duracell is setting a benchmark for safe drone travel and use in Canada by working closely with Transport Canada and InDro Robotics. This combined team has played an integral role in ensuring each aspect of the trip has been carefully planned including the approvals of drone pilots, drones, route, and transport. In addition to the online portal, footage can also be viewed on Rogers Channel 100 on-demand starting mid-August. Canadians who want to support the journey can help drive awareness by sharing content, telling their neighbours and friends, and if they see the drone journey in their community to come out and meet the team. Follow Explorer150 at duracelldrone.macleans.ca, by using the #explorer150. Started in the 1920’s, the Duracell brand and company was recently acquired by the Berkshire Hathaway Company (NYSE-BRK) and has grown to be the leader in the single-use battery market in North America. Its iconic brand is known the world over. Our products serve as the heart of devices that keep people connected, protect their families, entertain them, and simplify their increasingly mobile lifestyles. Our recharging technology allows consumers to live life without limits. Berkshire Hathaway is a $210B holding company owning subsidiaries that engage in diverse business activities. Visit www.duracell.com for more information; follow us on Twitter.com/Duracell and like us on Facebook.com/Duracell. InDro Robotics is a Canadian company, who focuses on complex drone projects including working with first responders and emergency and disaster management. InDro Robotics employs 18 engineers, scientists commercial pilots and ex-military personnel, in facilities across Canada and the US (BC, AB, ON and the WA). In 2016, InDro Robotics became the first Transport Canada fully compliant UAV company by combining aviation practices and training with their in house robustly built UAV capable of extended missions. From movie shoots to crowd management, tracking sea wolves to mapping ice flows, InDro Robotics continues to push the innovative uses for drones.